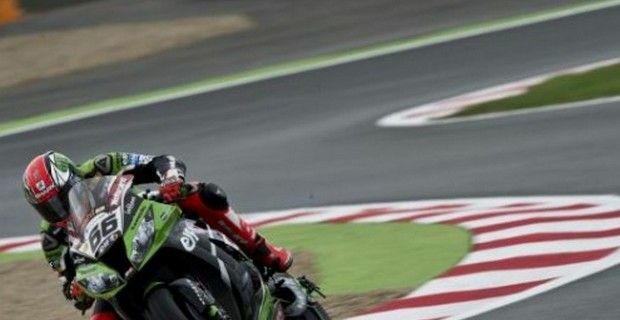 Tom Sykes took a double victory yesterday in the penultimate round of the World Superbike championship at Magny-Cours to further cement his title advantage as the championship heads towards the season finale at Jerez de la Frontera in less than two weeks. The Kawasaki rider scored a full 50 points on Sunday to take a 37 point advantage over title rivals Eugene Laverty and Sylvain Guintoli. Starting from pole position, Sykes moved into the lead immediately and despite efforts from the two Aprilia riders, the Briton made a clean break from Guintoli after the fifth lap, and remained uncontested from the rest of the field until the proceedings were halted by a red flag on the fourth to last lap when Pedercini’s Mark Aitchison highsided with his Kawasaki ZX-10R, with the machine going up in a blaze of fire on the asphalt. Guintoli would score a second place podium, while team mate Laverty couldn’t match the two front-runners having been caught up in a heated battle with BMW’s Marco Melandri and Althea’s Davide Giugliano early on, which made him lose contact, he would however prevail and ride to a lonely third. Following in fourth was Giugliano, while Marco Melandri saw his attempt to keep his title challenge alive, fizzle out after finishing in fifth. Ducati’s MotoGP test rider Michele Pirro, who is replacing recovering Carlos Checa in the Alstare Ducati team rode his Panigaleand took sixth in his WSBK debut after crashing twice on Saturday, and he bested Pata Honda duo Michel Fabrizio (replacing injured Jonathan Rea) and Leon Haslam. Alstare’s regularly contracted rider Ayrton Badovini finished in 9th and ahead of WSBK returnee and veteran Lorenzo Lanzi who closed out the top ten, riding an outdated, but still very much homologated Ducati 1098R for wild card team entry, Mesaroli Transports A.S.
PHOTO GALLERY: SBK Magny Cours 2013 - The Paddock Girls! The second SBK race was red flagged as well, but this time for drizzling rain and the fact that Guintoli and Laverty who were battling for second crashed out on the final lap at the Adelaide corner, as Sykes was once again crossing the finishing line with an ample margin over the second and third place finishers. Luckily for Laverty and Guintoli, they were able to remount and return to the pitlane within the five minute rule and based on the count back were credited with podium finishes. Magny Cours is Sykes' third double victory of the 2013 season after the Donington Park and Imola rounds. Davide Giugliano took another fourth-place finish ahead of BMW rider, but this time it was Chaz Davies, who made up for his DNF in race 1, while team mate Marco Melandri couldn’t do better than 7th. World Endurance Champion Vincent Philippe who was filling in for injured FIXI Crescent Suzuki rider Leon Camier, took an excellent sixth after being caught up in the tail end of Toni Elias’ crash in the first race, while the Red Devils rider grabbed 8th ahead of Lorenzo Lanzi and Ayrton Badovini who finished tenth, much better than temporary team mate Michele Pirro who crashed out early. Race 2 proved to be highly problematic for the Pata Honda riders as both Haslam and Fabrizio suffered technical issues that forced them to pit.